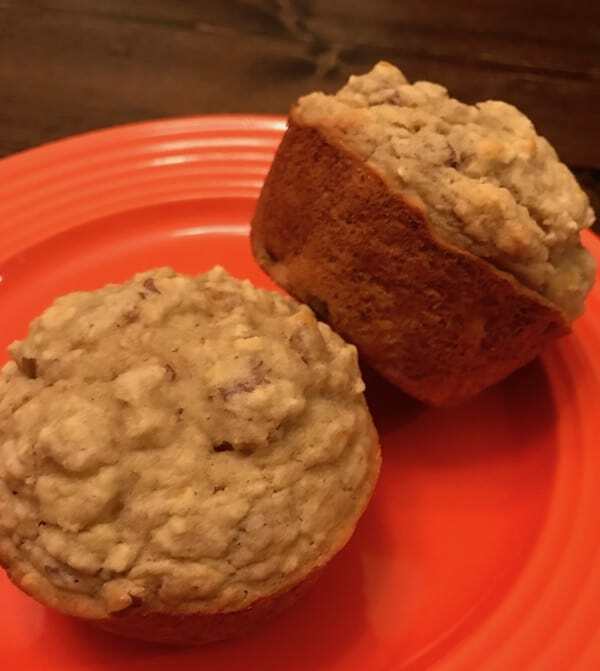 Banana nut muffins are not only delicious but they also have quite a few nutrients to keep you healthy and feeling great. Whether you eat them for breakfast or a between-meal snack, you’ll discover they’re one of your favorite foods. One of the best things about these muffins is that they can be made gluten-free. It all depends on the type of flour you use. 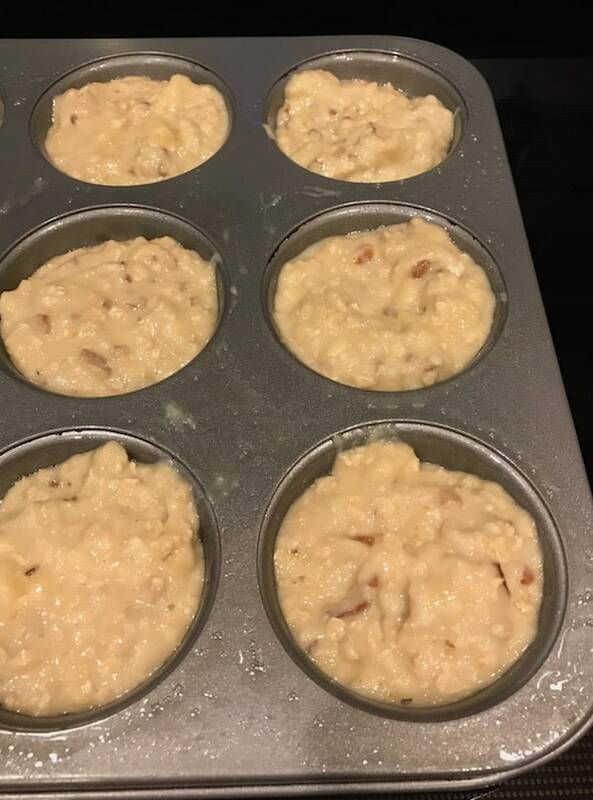 I also like to make banana nut muffins for variety. When I first discovered that I had a gluten issue, I struggled to find something I enjoyed eating. It seemed as though I’d have to give up some of the deliciousness I so enjoyed when eating. At first, all I saw were substitutes that were subpar and lacking in the flavors of the original versions. That was many ago. Since then, companies have recognized the need to satisfy the hunger of those of us who can’t tolerate gluten. Instead of having grainy pasta or baked desserts that taste “off,” we can have what we’ve always liked. To top it off, most of today’s gluten-free food tastes wonderful. Although I do purchase some ready-made food, like Gluten-Free Tate’s Cookies, I bake a lot as well. And I’ve learned to alter most regular recipes to make them work for me. For example, I make mug cakes with gluten-free cake mix. You can use whatever cake mix you have on hand. I also make macaroons without any flour at all. And if you haven’t tried my flourless peanut butter cookies, you’re really missing out on a tasty treat. 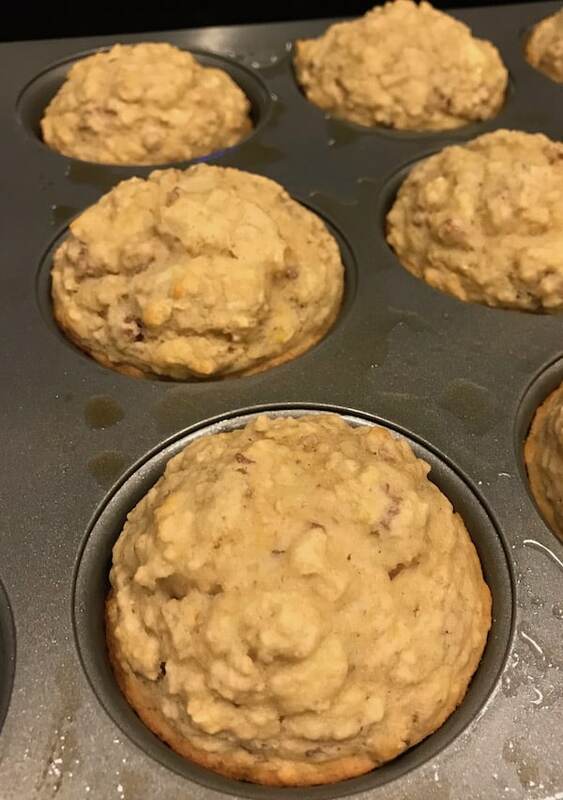 In addition to being tasty, banana nut muffins are good for you. At least the way I make them, they are. 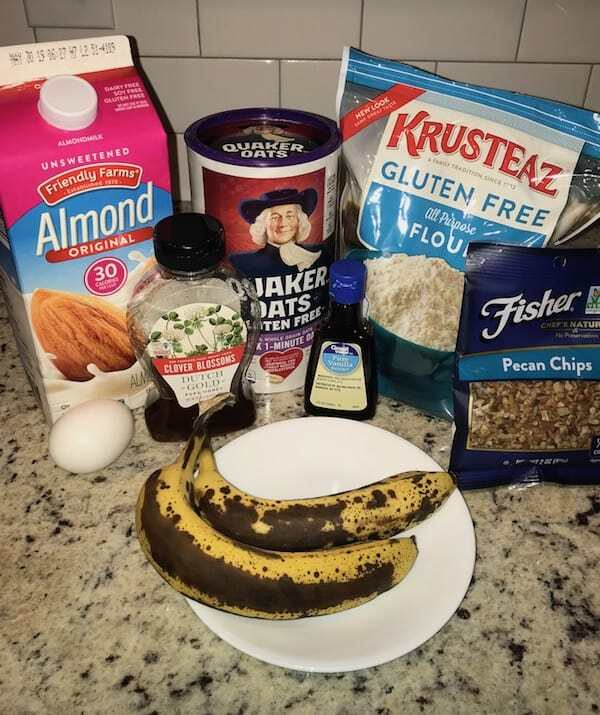 I use ripe bananas that are loaded with potassium, nutritious pecans, and oats. You’ll get lots of vitamins, protein, fiber, and other great nutrients you need to stay healthy. 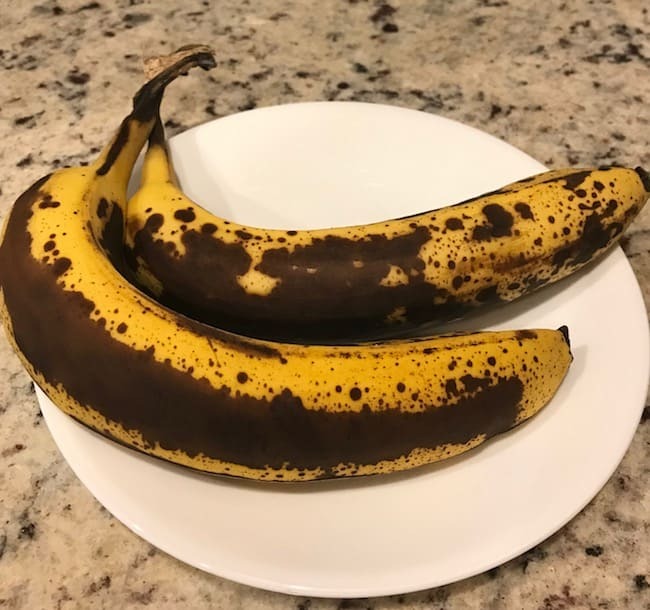 This is one time when you want your bananas to have spots on them. So if you don’t have ripe ones on hand, look for them at the grocery store. Sometimes when they’re very spotted, they’re discounted. You probably have the ingredients you need to make these muffins. The dry ingredients include all-purpose flour (regular or gluten-free), oats, baking powder, crushed pecans, and a dash of salt. Next, you’ll need overripe bananas, an egg, maple syrup, milk, and a dash of vanilla. If you don’t have to be gluten-free, by all means, use regular flour. If you were to taste them both, you probably wouldn’t be able to tell the difference. In a large mixing bowl, mash the bananas. Add the egg, maple syrup, milk, and vanilla. Give it a good stir. In a separate bowl, combine all of the dry ingredients. Stir until everything is blended. Next, gradually pour the dry ingredients into the wet ones, mixing as you pour. Finally, bake them in a muffin tin—either with or without paper muffin cups. If you don’t have them, that’s fine. Just use nonstick cooking spray to keep them from sticking. You’ll wind up with some of the tastiest muffins you’ve ever tried. If you prefer additional sweetness, you may add more maple syrup or a couple spoons of sugar. 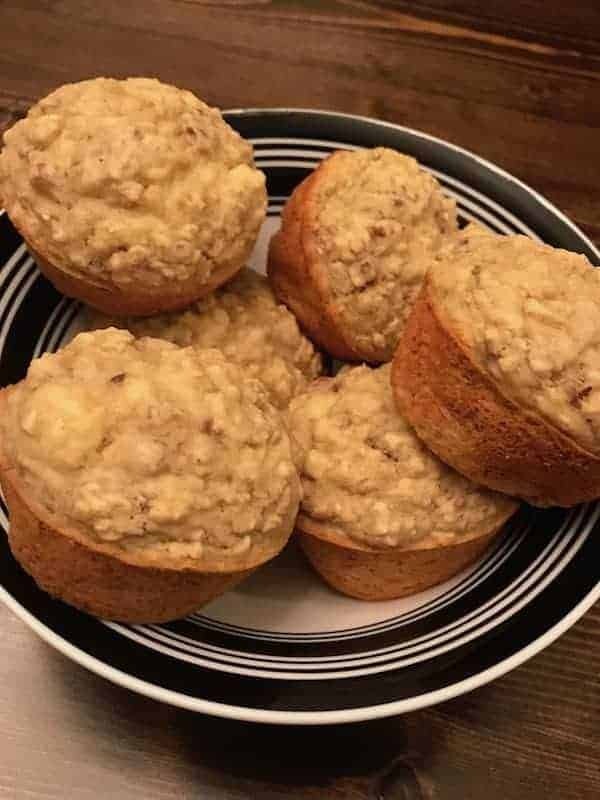 If I have time to sit down and enjoy my breakfast, then I like to have these banana nut muffins with some eggs and coffee. However, there are times when I have to eat on the run, so I might just grab a muffins and a piece of fruit on my way out the door. I also enjoy having them for a mid-afternoon snack. These muffins can be made regular or gluten-free, depending on the type of flour you use. They are delicious any time of day, and they're good for you. Preheat oven to 375 degrees. Spray a medium size muffin tin with nonstick cooking spray. In a large mixing bowl, mash both of the bananas. Add the egg, maple syrup, milk, and vanilla. Stir well. In a medium mixing bowl, combine the flour, oats, baking powder, and nuts. Mix well. Slowly add the dry ingredients to the wet ingredients, stirring as you go. If you like extra sweetness, add the sugar, a little bit at a time. 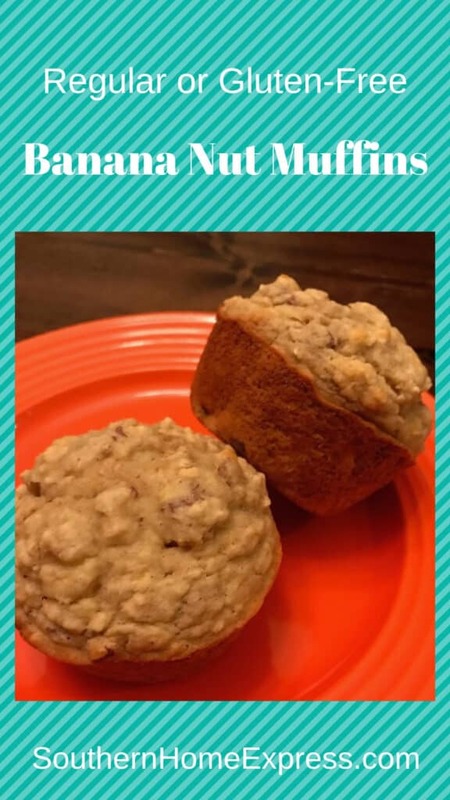 Scoop the mixture into the muffin tins and bake for 18 minutes. Remove from the oven and allow to cool for at least 5 minutes before removing them from the tins.